Thank you Espermachine - unfortunately that link references using Light & Shadows - > Dropshadow. When I open the Light & Shadows drop down there is no option for Drop Shadow. You aren't missing just Drop Shadow, but also a couple of others. In your Gimp installation do you see usr/share/gimp/2.0/scripts/drop-shadow.scm, usr/share/gimp/2.0/scripts/perspective-shadow.scm, and usr/share/gimp/2.0/scripts/xach-effect.scm (that you all seem missing)? 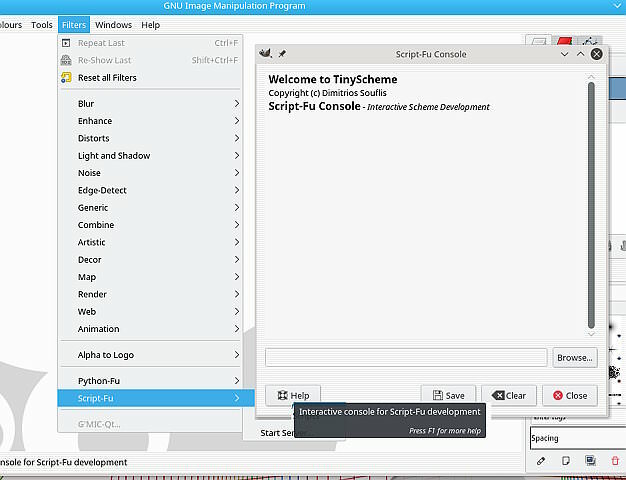 Do you have any script-fu something.scm working? Go to Edit -> Preferences -> Folders -> Scripts. What do the entries show? This is linux, OSX will be different but should still be two entries. Is the 'usr/share..' one missing? Post a screenshot if possible. I wish there were some experienced Mac users around. If you installed a new Gimp 2.8.x over an older version, there might be a conflict somewhere. Check in your Gimp folder /Applications/GIMP.app/Contents/Resources/share/gimp/2.0/scripts that the files do exist. (01-26-2018, 05:28 PM)rich2005 Wrote: I wish there were some experienced Mac users around. Rich - you must be a miracle worker. I shut down Gimp (which I had done before) again and then went searching for any .scm files. Found a bunch of them. So, I opened Gimp. This time the drop shadow option appeared along with some others that were missing. Thank you for pointing me in the right direction. Looks like I am good... at least for now!